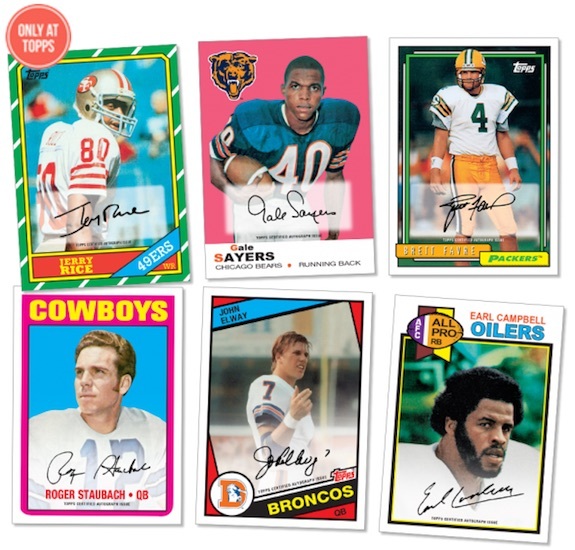 Issued as an extension of the flagship release, 2015 Topps 60th Anniversary Retired Autograph Football takes a hit-only look at some of the top NFL players of all-time. The online exclusive delivers one autograph per pack. Showcasing each subject on their respective Topps rookie design, a total of 34 names are included in the Canton-heavy checklist. Some players, including Brett Favre, are shown on their first main Topps release as opposed to their rookie card. The mock-up for Favre shows him on his second-year Topps card (1992) as he did not have a flagship rookie card in 1991. While the base versions are not numbered and no production run was offered, randomly inserted Silver (#/25) and Gold (1/1) parallels provide additional rarity. Sold directly through the Topps Online Store, each one-card pack guarantees a Hall of Fame-level signature. Packs are available for $75 each and will begin to ship starting on February 29. The limited product only includes the signed versions and no other cards. All autographs are live in packs and there are no redemptions. Live cards offer a small 60th foil stamp in the top corner and sticker autograph. Honoring the 60th anniversary of Topps Football, 2015 also marks the end of NFL card coverage from the company for the foreseeable future. ANTHONY MUNOZ 2015 TOPPS 60TH AUTOGRAPH AUTO -BENGALS!! 2015 Topps Terry Bradshaw 60th Anniversary Autograph #12 25 - Jersey Number!!!! 2015 Topps Y.A. Tittle 60th Anniversary Autograph - Hall of Famer! 34 cards. Shop for cards on eBay. This is the best value Topps has ever offered. Most 10 pack breaks I have ordered have better hits than 10+ cases of most Topps products. Here are odd over 300 breaks I have seen from large breakers…. Are all these autographs stickers? Saw these late…Madbreakers on breakers.tv has Pick Your Player drafts…got an awesome Jim Kelly. These cards are awesome. (48) 2015 Topps Finest Football Factory Sealed HOBBY Hanger-96 Packs=8 Box CASE!